The corn, the corn, we can’t escape the corn. But who’d want to? Corn, about now, is as good as it gets, and will vanish before you know it. I spend a great deal of shopping time in early Fall inspecting ears of corn at outdoor stands and in grocer’s bins. This one has fat yellow kernels – score! I recently came across a recipe for a corn and coconut salad, where the corn was cooked in butter seasoned with thyme and red onion, then tossed with almonds. This Heidi Swanson recipe sounded interesting – I’ve never tried corn paired with coconut, and I thought this corn and coconut combination would also taste good with Thai flavors; a variation on a theme. I found the Thai flavored cashews in the bulk section at Whole Foods; toasted peanuts would be delish and less expensive alternative. For an easy vegetarian supper, this would be a fine match with jasmine rice or cellophane noodles. Here’s a list and preview of other recipes using the seasons bounty. Heat oil in a large sauté pan over medium heat. Add the corn with a pinch of kosher salt, and stir to coat. Cook for one minute. Stir in half the cilantro, then transfer to a large serving bowl. 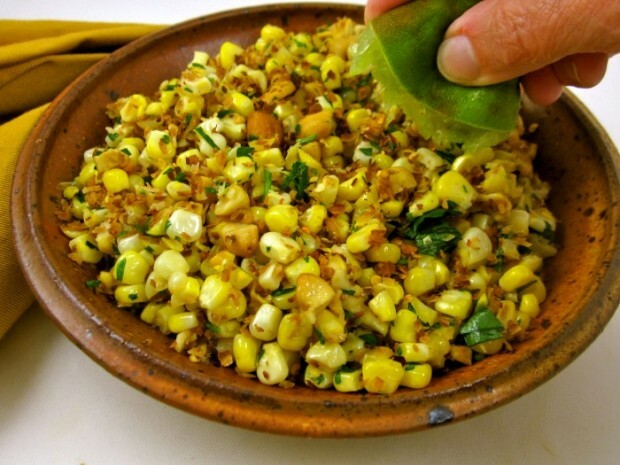 Just before serving, toss with coconut flakes, peanuts, remaining cilantro and 2 tablespoons lime juice. Stir well. Season to taste with kosher salt, chili pepper or flakes, and additional lime juice, if desired. the globe who are misԁia&X67;&X6E;os&X65;d.
w&X68;at іs beliеved to bеcome ADHD. the child’s everyday hyperactive behavіor.